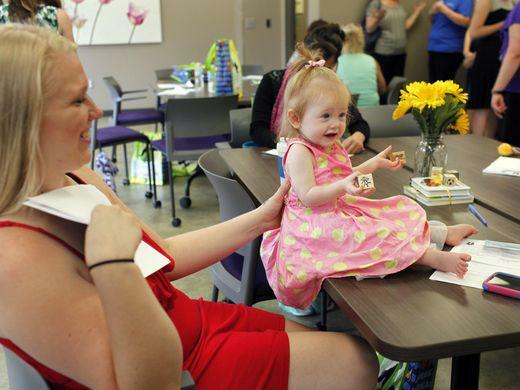 Katarina Likins, 24, left , and her daughter Lilliana Hardin, 10 months, attend a free community baby shower for new and expectant parents hosted by Family Health Centers, Mama to Mama and WellCare. Written across the white cake decorated with miniature baby bottles on its corners and pink and blue baby feet and balloons made of icing on its top were the words: "You've got this Mama!" The words of encouragement remained a mantra throughout Wednesday afternoon at the community baby shower at the Family Health Center on East Broadway. The shower was hosted by various organizations such as Mama to Mama, WellCare and Volunteers for America. The community baby shower is one of the many ways these groups collaborate to bring expectant mothers and other moms together. The latest collaboration is a new peer-support program with Mama to Mama, a nonprofit dedicated to building social support for expectant and new mothers. Shannon Stone Porter, executive director of Mama to Mama, said the program will match families for a three-month period. During this time, mothers or families will participate in weekly check-ins and meet regularly at communal events such as play groups, story time or prenatal classes. After the three months, mothers are encouraged to participate in one of the other many programs Mama to Mama offers. Over the course of the next year, the group plans to pair at least 10 sets of moms. Mama to Mama's new program is working in part with a group of women from ChooseWell Communities in Project Thrive. The women in Project Thrive are graduates from Freedom House, a residential addiction recovery program. Jennifer Hancock, president and CEO of Volunteers for America, said mothers who are currently a part of Freedom House will also have the opportunity to be matched with a mentor. "It's very meaningful to our moms," Hancock said. "They feel very supported and loved by Mama to Mama." However, Stone Porter said the program is also open to all mothers in the community. The goal of the new program is to connect expecting mothers with the resources that are already available, Stone Porter said. "There's a lot of incredible services in our community that is very specific and they do really great work but if you don't know about it, you can't access it," she said. WellCare of Kentucky is providing the $9,000 grant for the new program. Elizabeth Starr, supervisor of community advocacy at WellCare, said WellCare has previously partnered with Mama to Mama and provided other grants to programs that have been successful and are now self-sufficient – including Arts in Play and prenatal education classes. "Their peer-support program was really intriguing to us because we know that moms need that extra bit of support in order to connect and help them through the tough moments of motherhood," Starr said. Freedom House resident Lyndsay Burns holds her daughter Jocelyn, 1 month, during a free community baby shower for new and expectant parents hosted by Family Health Centers, Mama to Mama and WellCare. Guests were given information about a new volunteer partnering program that encourages new moms to meet other moms and form peer support groups. For mothers who have suffered from addiction such as Katarina Likins, these organizations have offered her the support and security she needed. Likins, 24 and a Louisville native, has participated in programs with Mama to Mama, graduated from the Freedom House and is a founding mother of Project Thrive. On the back of Likin's leg, black cursive letters spell out "Thrive," a sentiment to the impact these programs have had on her. In August, Likins will have been sober for a year, and at 10 months old, Likin's daughter, Lilliana, remains her motivation. Next month, Likins plans to start school next month to pursue her dream of being an auto mechanic. Likins said she hopes to build the same support network for her daughter that Mama to Mama, ChooseWell Communities and Project Thrive have now given her. "They've (these organizations) never left my side," she said. Reporter Lashana Harney can be reached at (502) 582-4188 and lharney@gannett.com. Follow her on Twitter at @lashanaharney.